Nigerians has been reminded of the need to always think of what they can do to positively contribute in promoting unity within their community rather than destroying it through crisis. The reminder was given when a Non Governmental Organization, ‘Global Peace Foundation Nigeria’ (GPFN), championing the message of “One Family Under God” campaign, visited the palace of the Chief of Chawai on Tuesday 29th November 2016, over the recent attacks that resulted in loss of lives and properties worth million of naira across four communities in the area. 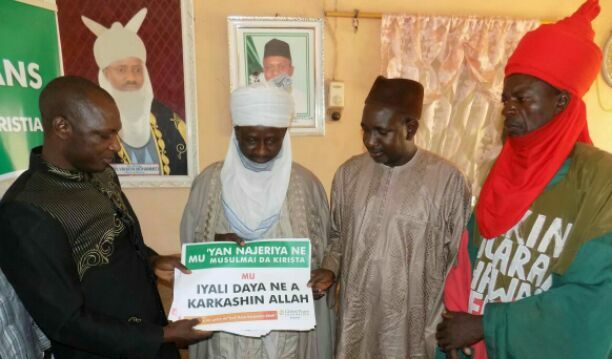 The Northern Co-coordinator GPFN, Sheikh Halliru Abdullahi Maraya, who gave the reminder while speaking during the visit said, the call became imperative considering the rate of incessant attacks on innocent citizens in some parts of Southern Senatorial zone of Kaduna State for selfish reasons. He admonished the people to continue to be tolerant, respect each other’s differences and not to resort to violence in resolving disputes. This is because all human being are descendants of Adam and Eve, signifying that we are members of one family in the eyes of God as enshrined in the Holy Bible and Quran. Sheikh Maraya noted that the reason most people indulged in instigating and promoting unrest in the name of religion or identity is their ignorance of the teachings of the Holy books (Bible and Quran), which he said must be addressed. Earlier, the Northern Co-coordinator GPFN, Rev. John Joseph Hayab, said the aim of the visit was to console the chiefdom and people of Chawai over the recent attack which led to the loss of lives and properties in the area and also to educate them on the vision of “One Family Under God” campaign as championed by the Global Peace Foundation Nigeria. He noted that all humans must learn to live according to the teachings of their religion, saying it is the only way to peaceful coexistence. Responding, the Chief of Chawai, Alhaji Abubakar Mohammed, commended the Global Peace Foundation Nigeria for championing the cause of peaceful coexistence through its “One Family Under God” Campaign, noting that peace remains key to societal growth and development. He stressed that the major cause of the unfortunate incident in the affected areas within his domain was as a result of dispute over farmland between a Fulani man and a community member. The Traditional Ruler stated that effort has been intensified to bring the perpetrators to book. He urged his people to always avoid taking laws into their hands. Some of the community members, Suleiman Ibrahim Joji, Rev. Yusuf Silas Sheyin, Alhaji Abdullahi Hussaini, Baba Saleh and Rev. Zacharia Gado, in their contribution, lauded the effort of the Foundation to ensure that peace is restored in the area, and pledged to carry the message of “One Family Under God” to every nook and cranny of the chiefdom for improved understanding and tolerance. They were optimistic that the peace the area was known for will soon be restored, as all hands are on deck towards actualizing it.